Sticky Rice (also called glutinous rice or "pulut" in Malay) requires long soaking in water before being cooked in a bamboo steamer. It is eaten on its own with dipping sauces, or it is served to accompany light dishes and vegetarian meals. Sticky rice grains are available in Asian markets and some supermarkets. Put rice into a big bowl and fill bowl with water. Let soak for at least 6 hours. Drain, then rinse and drain again. Fill a wok or a heavy-based saucepan with enough water to come a third of the way up the sides. Place a bamboo steamer, with lid on, over wok and bring water to the boil. Lift lid of steamer and place a dampened piece of muslin over rack. Tip rice into the middle and spread it out a little. Fold edges of muslin over rice, put lid back on steamer and steam for about 25 minutes, until rice is shiny and tender but still firm. Black Sticky Rice – Replace white sticky rice with black sticky rice. Beautiful Purple – Substitute black sticky rice for half the white rice. Soak the two rices together; the white rice will turn a beautiful purple as it takes on color from the black rice. Steaming will take 10 minutes longer. 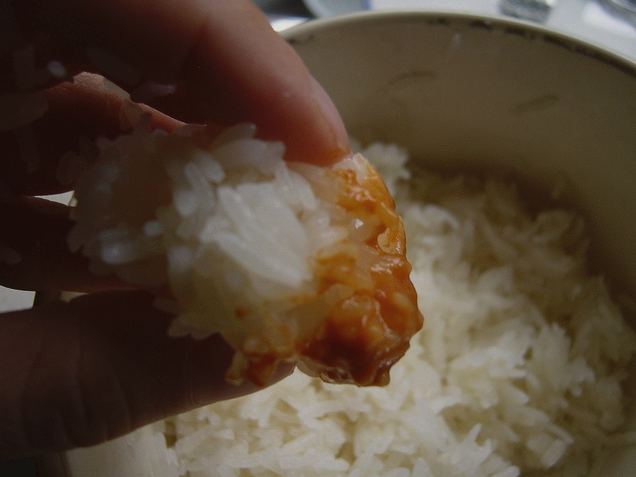 Coconut Sticky Rice – In a heavy pot, bring to boil 400 ml unsweetened coconut milk and 250 ml chicken stock or water. Stir in 225 g sticky rice grains, soaked and drained. Stir once with a pinch of salt and simmer for 25 minutes, until liquid is absorbed. Let steam, covered, 10 minutes. Coconut Milk Sticky Rice with Mangoes (Khao Niaow Ma Muang) – For the coconut sauce, place 2 cups fresh coconut milk in a heavy pot and heat over medium heat until hot. Do not boil. Add 3/4 cup palm sugar and 1 tsp salt and stir to dissolve completely. Arrange the sticky rice in a bowl or plate (an ice cream scoop works great) with ripe mango slices in some kind of pretty formation and dribble a bit of the sauce over. Sprinkle with toasted sesame seeds. Serve at room temperature. Ah the lovely Basmathai, I’m not really sure what this tastes like. It should be really nice with chicken. I agree, I’ve eaten these type of rice once in the lifetime. This made me to do it for the second time. Is this like literally sticky? In some countries, cooked rice being sticky is considered as a bad sign!